Following Sunday's game, the first-half finale for the Salem Red Sox, the club announced the promotions of second baseman Yoan Moncada, left-hander Jalen Beeks, and right-hander Ben Taylor to Double-A Portland. At present time, corresponding roster moves are unknown, although right-hander Justin Haley had been promoted to Pawtucket from Portland on Friday, opening one spot on the roster and in the rotation that Beeks will likely fill. 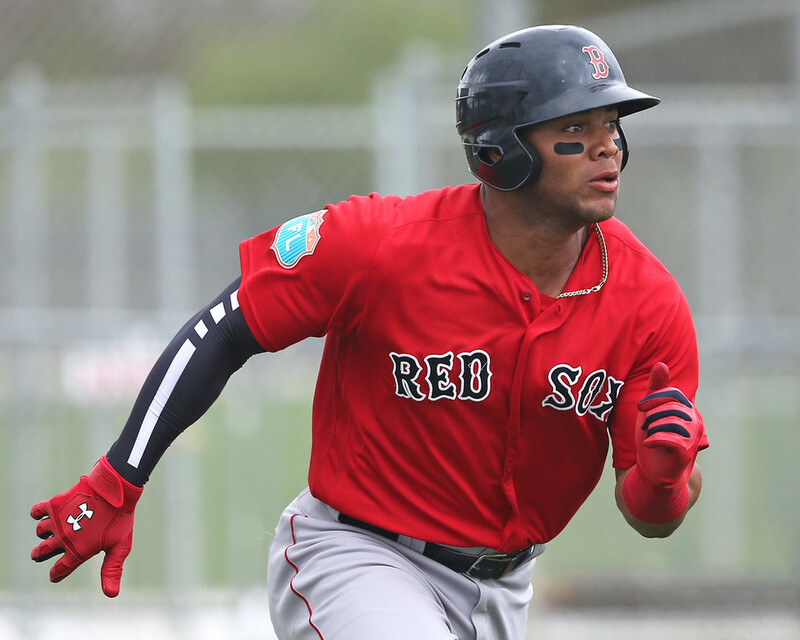 Moncada, currently the top-ranked prospect on the SoxProspects.com rankings, had a very strong first half for Salem, which ended on Sunday with his slugging the game-winning home run in the eighth inning of Salem's 2-1 victory over Winston-Salem. He hit .307/.427/.496 with 25 doubles, 3 triples, 4 home runs, and 45 walks to 60 strikeouts over 61 games. Despite being a year and a half younger than the average position player, the 21-year-old Moncada was leading all of the minors with 36 steals on 44 attempts, and also led the Carolina league or was tied for the league lead in on-base percentage, OPS, and doubles. Moncada had been held out of the lineup for the last five days as a precaution, but returned to the lineup on Sunday. Although Moncada was selected to the Carolina League all-star team, but the Boston Globe's Alex Speier reported earlier in the week that the Cuban would sit out the all-star game. Beeks, currently ranked 29th on the SoxProspects.com rankings, has posted a 3.07 ERA in 13 starts this season for Salem, striking out 55 and walking 24 in 67 1/3 innings. The Red Sox 12th-round selection in the 2014 draft out of Arkansas, Beeks spent all of last season in Salem, striking out 100 and walking 28 while posting a 4.32 ERA in 145 2/3 innings. Taylor, ranked 45th in the SoxProspects.com rankings, was the Red Sox seventh-round pick in last year's draft. A senior out of South Alabama, he signed for a $10,000 bonus, but he becomes the second player from last year's draft class to reach Double-A, following the seventh-overall pick, Andrew Benintendi, who was promoted just over a month ago. Taylor, who has a 2.60 ERA and 56 strikeouts with just 10 walks in 45 innings this season, has particularly excelled since moving from the rotation into the bullpen. In something of a piggyback role—he has thrown at least 40 pitches in six of his 12 relief outings this year and has had fewer than three days' rest just once—he has struck out 44 batters and walked seven in 32 innings, allowing just 18 hits and seven runs after allowing 17 and seven in his first 13 innings of the season over three starts. Chris Hatfield is Executive Editor at SoxProspects.com. Follow him @SPChrisHatfield. Senior Staff Writer Will Woodward contributed to this story.